r ranson wrote: Hey guys, moderator here to give this thread a nudge. Let's avoid plastic based solutions. People were doing this long before plastic came around and I bet there are loads of options to seal a planter that doesn't involve crude oil. 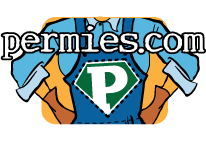 At permies we seek solutions that are organic or better. I'm not sure how many indoor waterproof basins existed before plastic, unless you're maybe talking about metal basins, which can't really be painted onto an existing wooden box. I think the difficulty here might lie in competing goals. At permies, it seems like we like natural solutions, because ithey are sustainable, so we like constructions that can decompose and return to the earth once they've served their purpose. By which, if we're being specific, we mean that, when exposed to water, they will rot. Trying to find a solution that will rot when exposed to water, while at the same time keep a box from leaking water and have a decent shelf life without ongoing maintenance, seems to me to be mutually exclusive objectives. It's possible that, if you're looking for a tub that can stay indoors (or possibly it's for outdoors, I'm not sure. Just that it "can't leak water everywhere") you're either looking at metal or some plastic-based solution. If you're looking for something that can be applied to an existing wooden structure, that probably eliminates metal as a possibility. Maybe a fired clay? But again, that's not something you can do once it's already applied to the wood. If you're just looking for an insert, then maybe. I think I read somewhere that these forums are also for appropriate technology. Especially if we're talking about reuising or recycling plastic taken from the waste stream, that is sometimes an appropriate technology, no? I looked into this briefly, and found it was one of those ideas that sounds great until you start doing the math. I don't want to go through all that math again, but the critical bit is that if you have a 2 liter bottle of water, and you want to raise it 1 degree (I'm using metric here, just because the math is easier) it takes as much energy as the average full grown man burns in a day. However if that 2 liter bottle is already ice (which snow is) you have to use 80 times that much energy to melt it, before you can heat it up at all.. And that's before you even start to take into account how much heat you lose heating an uninsulated driveway, where all the heat can escape to the atmosphere or into the surrounding ground, which is likely either saturated with water or frozen itself. I haven't tried it myself yet, but would sheet composting help with your bramble problem? Seems like it would completely suffocate the existing bramble, and then you could plant whatever you wanted over top of it - vetiver, clover, blackberries, fruit trees, or even better, all of the above. Aspen cordwood - is this wood good for cordwood masonry walls? Dale Hodgins wrote: I didn't realize we were in that section. Aspen is one of the most likely woods to rot. It is often started rotting before being cut. I would never use any of it for that purpose. Just about any evergreen would be more suitable. There's also a very good article that explains why the concern for rot in cordwood masonary is for the most part unfounded if a few very simple precautions are taken. I agree with David on the complexity in turning it into a liquid fuel product. Certainly doable, but probably not practical on a small scale. Can we expand on this a little bit? Certainly, this is experimental, unproven technology. Just as the rocket mass heater was at first. (Have you ever seen the post where that thing was first suggested? The prototype looked like a cob monster took a dump on the garage floor!) There's some scientific principles at work with this idea that, from my perspective, seem to pan out, and it obviously needs a lot of experimentation and repetition in different circumstances to get it to the point where we can all trust it as appropriate technology. But that process has to start somewhere, right? Why are we dumping on this idea and saying it can't be done before it's been tried? Isn't that kind of against the whole Permies vibe? * Algae is easy to grow. It's a nuisance problem - a weed, if you will - in any fish aquarium or aquaponics setup, or even in rainwater storage. Set up a few IBC totes in the sun and fill them with nutrient rich water, and you will grow algae without trying. It doesn't need a sterile system or fancy, expensive equipment to grow algae. The ocean (nature) does it all by itself without intervention. * Distillation is not that hard. Alcohol evaporates at a lower temperature than water, so all you're doing is boiling the alcohol off, capturing the vapor, and cooling it down again to liquify it. The most common way of doing that is just by running water over the tube that the gas is in. Hillbillies are famous for it. Prisoners do it (while in prison). It's not that difficult and doesn't require sophisticated machinery. Yes, of course there are stories of people being stupid and getting hurt. That's always the case when you're talking about fire. It's true for RMH as well. Just be sensible, take reasonable precautions and be careful. It's no more dangerous than using gasoline. * Liquid fuel is handy. I don't know that I'll ever retrofit my car or my tractor to run off this stuff. I'm not that mechanically inclined. But as a cooking fuel? A hot water heater fuel? Even emergency generator fuel? Heck yeah. And being that much more independent and off grid sounds like a winning scenario. I am currently using propane for these three things, which is nice because it doesn't go bad and I can buy a year's worth from a non monopoly, but being able to produce and easily store the fuel for these myself is a better solution. Methane digestion is cool and may be as easy to produce, but not as easy to store. Oil is easy to store, but not as easy to produce. Wood is easy to produce and easy to store, but difficult to pipe or to automate. A sustainably produced fuel that stores as liquid at room temperature in ordinary containers is decidedly a good thing. What I don't know about (from my own experience, I mean) is the whole fermentation process. Is it as easy as throwing some brewer's yeast into a vat of algae? Does pressure or specific temperature ranges need to be maintained? Also, what about the byproduct after distillation? I assume, being mostly botanical, that it could just go on the compost pile or thrown on the ground somewhere, but maybe the chemical changes involved make it more icky? I'm wondering if the reason we're being so wet blanket here is because the title of this thread looks like another hairbrained idea for free energy. So maybe there's some kneejerk negativity going on from people who have had to deal with hundreds of posts from people who don't understand thermodynamics. But this idea is not violating Newton's laws here. All we're doing is converting solar energy into a storable, liquid form, similar to growing trees, which converts solar energy into solid fuel. Am I missing some other aspect? What about this process doesn't work on a small scale? I think you could conceivably do this for much cheaper. I would think a 200-400 watt solar power system could run this just fine, especially if you only ran the necessary distillation components during the day and didn't need to run them 24 hours a day. That would cost you somewhere in the neighborhood of $1000-1500, including installation if you can do a few hours research and have enough handyman skills to install a standard electrical outlet. You also do not need full blown air compressors for aerating the stock tanks. One single air compressor for all three tanks would be overkill. Much better to get a few aquarium air pumps, which can be had new at $60 apiece, and asking anyone whose ever kept fish will tell you that those things grow algae just fine. And you can pick up all the tubing and airstones you'd need at a fish or pet store for maybe $50 tops. By my count that brings the total down to $2500-3000, plus a shed if you really don't have any other storage place on your property already. It seems like there is some merit to this idea, and some of the naysayers may just be nit-picking. I'm sure this isn't a golden ticket to free energy, but producing your own fuel on site does have some appeal. Methane digestors are cool, but as I understand it, methane is non-compressible, so storage is kinda tricky, whereas liquid ethanol is a lot easier to produce and store in big batches, and then use as needed. Is there a way to make this functional/appropriate technology? Jeremy Franklin wrote: I just saw someone being not nice and thought I'd do my part, but couldn't figure out how to. Please, if you see something like that hit the 'report' button and tell us. This place gets kinda chaotic and stuff gets missed. It's much, much better if we can nip things in the bud before things get totally out of hand. Burra, sorry, but that's the whole point of this thread. 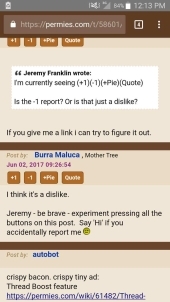 If you're on mobile view, there is no 'Report' button. See my screenshot above.